Click to meet the Little Rock Nine members. 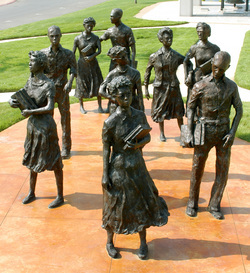 The Little Rock Nine® Foundation was created to promote the ideals of justice and equality of opportunity for all. Forged in the crucible of fierce opposition to the educational pursuits of nine young black children, the Foundation is dedicated to the proposition that racist ideology will not dictate educational policies and practices in the 21st Century. Too many children still do not have access to adequate educational opportunities in the 21st Century. Because of their struggles for a quality education, the Little Rock Nine members, through their Little Rock Nine® Foundation, are committed to assuring that our youth, especially children of color, are equipped with the knowledge and skills they need to become future leaders. The mission of the Little Rock Nine® Foundation is to provide direct financial support and a mentorship program for students to help them reach their educational goals. Further, it is our mission to encourage young people to take executive responsibility for their education, to step forward boldly and seize any available opportunity to expand awareness and understanding. The Foundation seeks to create a viable link between young learners and those who offer support for their efforts. Copyright © 2011-2015 Little Rock Nine Foundation ®. All rights reserved worldwide.